Oak Ash & Thorn--OAT for short--are an a capella singing group who draw their repertoire primarily from English Traditional music. We also sing British Music Hall, American Folk, Scottish Folk, Irish Folk, TV Jingles, Babylonian Beer Hymns. The only thing a capella we don't sing is Barbershop. At least, not yet...and probably not ever. 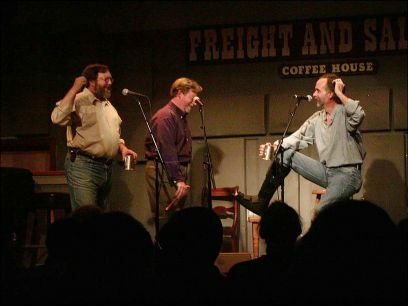 We have been a persistent fixture of the San Francisco Bay Area folk scene since the early '70s, thanks primarily to our audiences--who come to sing and drink along with us in a grand tradition of bibulous and sonic excess. Without them we'd still have three lobes on our livers and be able to hear our wives asking us to take out the garbage. Good question. Singing, drinking, laughing at and with ourselves and empowering others to do much the same thing...we hope. If you can't laugh at yourselves, you can certainly laugh at us. As for the drink...aren't you buying? ?